As the name suggests, a quiet opening. Dangerous only in the hands of an expert. Against precise play White cannot really claim any advantage. This is one of the most spectacular themes in the whole realm of chess. It has inspired some striking brilliant attacks. So far, its a quiet game. Now it starts to show life. Inferior to 12. Qe3, which would have avoided the ensuing complications. The spineless alternative 13. Bxd8, Nxc3 leaves White a pawn down. Now we see why Black sacrificed his Rooks. He has a mating attack. Black has his eye on this pretty mate: 18. Kxe4 Bf5+, 19. Kd5 Qd4 mate. A pretty finish. The rationale behind the two-Rook sacrifice is clear: the loser's Queen, in the process of confiscating the Rooks, wanders away from the field of battle to be of any further use. Tired? Do you have a mobile phone? Visit Free Mobile Software. It was named after the famous 18th century player François-André Danican Philidor, who advocated it as an alternative to the common 2...Nc6. His original idea was to challenge White's center by the pawn thrust ...f7-f5. Today it is known as a solid, though passive, choice for Black. Chess has an inexhaustible supply of sacrifices. The double-Rook sacrifice always appear in new guises. White threatens to win with Qd5. The safest defense is 5......c6. Black selects a more venturesome line, which allows White to win a pawn in a very risky fashion. There is more here than meets the eye, as in this pretty line of play: 9. Qxb7 Nb4, 10. Qb5+ c6, 11. Qa4 Nc5!! winning White's Queen (for if 12. Qxb4 Nd3+). White cannot bypass this inviting move, especially as he sees that an exchange of knights will leave him behind in development. Black has three pieces under attack. This leaves White with little choice, for after 12 cxb4, 0-0 Black has too many strong threats. White resigns. He has no defense against the threat of Qe2 mate. White's greed led to disaster. Tired? Do you have a mobile phone? Visit Free Mobile Phone. The Falkbeer Gambit is usually employed by Black against the King's Gambit with the idea of paralyzing White's center. The Gambit offers a pawn instead of taking the gambit and advances the e-pawn with the idea of preventing Nf3 and the advance of White's d-pawn. This countergambit surrenders a pawn for technical and psychological reasons. The technical objective is to obtain a substantial lead in development, the psychological motive is to befuddle White. This pawn can be a stumbling block to White by preventing the natural Nf3; or it can become a target for White's attack, provoking him to waste time winning the advanced pawn. This explains why White's best course is to shunt aside these complications and simply play 4. d3, ensuring the removal of the obnoxious pawn. White is following the faulty tactic of winning the King Pawn. He will live to regret it. For after 9. Nxc5 Black wins the White Queen with 9. ...... Re8. Getting rid of an important enemy piece, but opening up a file which will be useful for Black later on. White prepares to castle, as the King file is getting too hot for his King. Developing with gain of time. A double-threat: 14. .....Bxg1 and 14. ... Qxb2. White's reply is forced. Neat play. White threatens mate. White can hold out much longer with 17. Kb2, although after 17. ... Bc5 he would be helpless against Black's attack. The text permits a lovely finish. The proverbial bolt from the blue, and still threatening mate. And now, with his Queen gone, Black threatens 8. ..... Rb1 mate. To create a flight square for his King. Here we see the real point of 16. .....Red8 !!! Black's devilishly posted King Rook cuts off the escape of White's King, so that Black can continue with 20.....Rb1 mate. With a material advantage, Black can afford to give up a pawn in order to gain time for development. Threatening 9. ....Qd4 winning another piece if White castles. Black had a better line in 9....Qh4+, 10. g3 Bg4, 11. Qf2 Qe7 etc. A neat surprise. Black has little choice, for on 12....Qxf3, 13. Nxe7+ regains the piece with a winning advantage. If now 14......Nxe4, 15. Bxf8 Nd2, 16. Bxf7+ Kxf8, 17. Be6+ Nxf1, 8. Rxf1+ Ke7, 19. Bxc8 and the threat of Bxb7 is absolutely decisive. On 16......Nd5, 17. Bxd5 cxd5, 18. e6 Nb6, 19. Rxf7+ etc. not to mention an overwhelming position. This little game abounds in bright ideas. The Muzio Gambit is rarely played nowadays. During the Romantic Era, however, this lively opening, involving as it does the sacrifice of a piece on the fifth move, was played frequently even against very good players. Here is an example in which Andressen, an attacking master, is brought to his knees in mere 17 moves. After Ne5, Qh4ch the attack passes to Black. Black still maintains a threat to win a piece, as he holds Qc5 in reserve, winning White's exposed Bishop. The idea behind this interesting move is apparently that after 6.... Qc5+, 7. d4 Qxc4, 8. Ne5 Qe6, 9. Nd5 Kd8, 10. Bxf4 White will have a fierce attack in return for the sacrificed piece. White's lead in development is so great that it negates, at least for the time being, his material loss. Black's King cannot run away. The "gambit" here is the White's f-pawn being offered to Black in order to build a strong center with d2-d4 and to attack f7. In order for Black to maintain the pawn advantage, he may well be forced to weaken his kingside. The King's Gambit was examined by the 17th century Italian chess player Giulio Polerio. and Luis Ramirez de Lucena. The King's Gambit is now infrequently seen at master level, as Black can obtain a reasonable position by returning the extra pawn to consolidate. Another move, Nf6, is vastly superior. White answers the Bishop check by sacrificing a handful of pawns. White should never capture the h pawn. It would expose the King to danger. The h pawn, as it is, shields the White King. In return for the sacrificed pawns, White has a lead in development, open lines and attacking chances. Black must be on the guard. To a casual chess player, this may look like an obvious move. Yet it is a bad choice. Of course. But White has a staggering reply. White threatens 20. Rxf8ch mate. On 19. ... Rxf6 he replies 20. Bxf6 mate. Black's best chance was 19. .... Kg7 20. Rd6+ leaving White with a won ending. Come and test your skills in FlyorDie's free Chess Game. 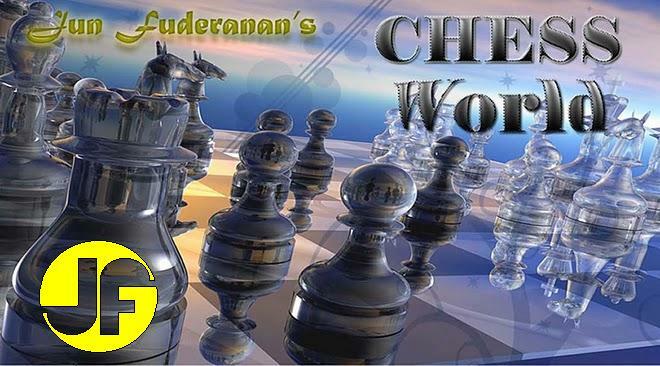 Play online with other chess fans. This site is intended to share my experiences and knowledge of chess games, techniques, theories, and puzzles to fellow chess enthusiasts. I invite everybody to comment on any post I publish so that I, too, may learn from them. I believe that in chess, one should play and learn at the same time. My father used to say that "the best way to learn chess is to play it". I agree.